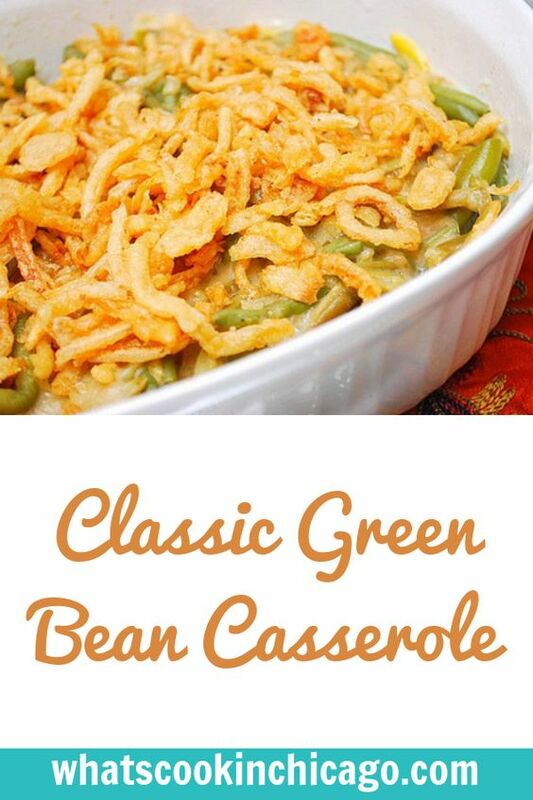 There are all sorts of adaptations for green bean casserole, but the classic would definitely be from Campbell's Kitchen. 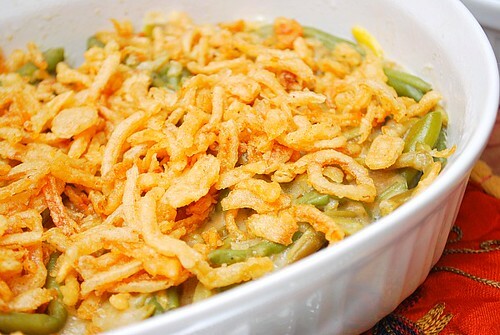 Green beans are tossed with cream of mushroom soup, some milk to dilute the soup, a splash of soy sauce, fresh black pepper, and topped with french fried onions. It's one of those dishes that can easily be a made in minutes and for me, completes a traditional Thanksgiving meal. Some adaptations you can make to this recipe include using a homemade cream of mushroom soup and using your choice of fresh, frozen or canned green beans. Angela used a combination of fresh green beans (which were grown in her mother's garden) and canned green beans. It was delicious and something I'm still craving for hours later. Trim off the ends of the fresh green beans and blanch briefly in hot water. Drain and pat dry beans with paper towels. Stir the soup, milk, soy sauce, black pepper, blanched and canned beans and 2/3 cup onions in a 1 1/2-quart casserole. 1. I thought my mother was the only person on earth who still made this until I recently saw a TV commercial featuring the recipe. 2. My mother insists on boiling the beans before baking with the mushroom soup, so her version is extremely mushy. I can see how baking from fresh beans makes a tempting side. Yay! I'm so flattered. I'm laughing a bit because this was the easiest of all of the side dishes we made. For yesterday's batch, I added a teaspoon of hot mustard and used green beans from my mom's garden. The beans were blanched before freezing. I thawed them in cold water. Then I gave them a ride in a salad spinner and patted them with paper towel to rid them of any excess moisture. That's the secret avoiding a mushy casserole. Gorgeous photo. I love the beautiful golden color of the onions. Green Bean Casserole is my son's favorite! Awesome~! I really liked this recipe although I will decrease the fried onion next time. My husband really enjoyed it. Looks like this will be a keeper in my house!